Gotta LOVE Craftsy! Peep their SALE!!! 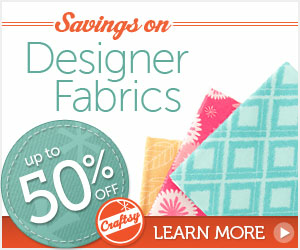 From 12/22 – 12/24, Craftsy is running its Christmas SALE! You’ve gotta check out their classes, which not only cover tons of fun quilting & sewing options, but also cake decorating, paper craft, gardening and more! Happy Holidays to all! Thanks, Craftsy, for being so WONDERFUL! It’s that time!! Time to announce our SUPER FLY RAFFLE WINNER!!!! Thanks to EVERYONE for the lovely comments! You know if we could, we’d let everyone win fabric!! Put your hands together for the wonderful ANDREA of andreacreates! Visit Andrea’s sweet site for creative inspiration. Happy Thursday to all! Wishing you a peaceful, relaxing weekend! 3 more days to come by the Sis Boom Show. Did you miss the show??? extended for three more days!!!! So please come by 1-5 Today Wednesday, and Thursday and then closed for the season. We had so much fun and there is so much left to make your Christmas complete we thought we had better extend the show. We are so happy to be part of your Holiday tradition.. Love you guys. That address again 40 East Meadow Rd. Wilton, Ct 06897. Lots of pillows, stockings, jewelry, ornaments, wreathes, clothing, pillow cases, belts, gifts, Banners, garlands, fabric, books, stationary, so come over and say hello!!!!! Tags: Christmas, gifts, Holiday, openhouse CT.
It’s a somber day here in CT as folks from Newtown begin to bury their loved ones from the horrific event that occurred there. Today I go inward and take time to consider those amazing beautiful people and their families and the extent of their loss. Please hold them in prayer as they begin this unfathomable process. This will be a quiet reflective post to salute those families and lift them up in prayer. May God be with them all. It’s the last day of our Sis Boom sale, and we’re so grateful to all of you that have made this sale what it is. Without you there would be no magic, no love, no spirit! Meet Joan, our dear friend, who’s helped us glitter our way through these past few weeks! She has been a critical helping hand in pumping out all of these handmade (with love) ornaments. Joan also has some very special creations of her own, right up at the front table… these awesome little boxes made with our favorite Sis Boom fabrics!!! Joan hand crafted each and every little box with such care. Each is topped with a little button. Perfect homes for precious sayings (as pictured), or a pair of earrings.. if it fits, it’s perfect! And folks have been snatching these up for gifts! Another Sis Boom friend– meet Gracie!! As we were getting started this morning, awesome Gracie walked in with her friend Stephanie (and their furry friend, Stella!!).. and then Gracie shared with us a quilt she’s been working on… and to say that we were LOVING IT is an understatement. Gracie has clearly been hard at work building this beautiful quilt and we can’t wait to see it as a finished product! Gracie, don’t forget to come back and show us! Way to go!! Seeing Sis Boom fabrics being used, especially by special Gracie, makes our day! Really! SO BEAUTIFUL!!! We JUST announced our raffle moments ago… and we couldn’t wait a minute more to announce our PDF PATTERN SALE! Yep! You read it right!! It’s our way of showing special Sis Boom friends who are far away that we’re always thinking about them! Here’s the deal: You have ’til midnight to use this coupon code for PDF patterns on our site. Buy as many as you’d like at this awesome price! COUPON CODE HAPPYDAY will get you $8 PDF patterns. So, get going & happy sewing!